On 16-17th of June the Embassy of Sweden in Bangkok and Business Sweden jointly conducted a Thailand-Sweden Smart City Collaboration. Eleven world leading companies, participants from academia and public representatives from Sweden in the field of energy, transport and safety participated with the purpose of enabling and strengthening knowledge sharing between Sweden and Thailand in order to build sustainable cities for the future. On 16 June at Okura Prestige Hotel, over 140 people participated at different seminars and panel discussions, opening remarks was delivered by the Swedish Ambassador in Thailand, H.E. Staffan Herrström. Key note speakers included the Minister of Science and Technology, H.E. Dr Pichet Durongkaverjoy and Minister of Transport, H.E. Dr. Arkhom Termpittayapaisith. 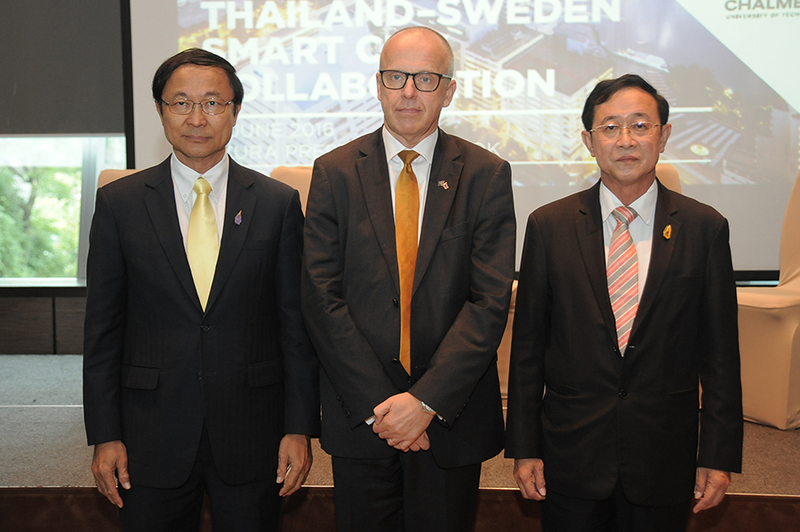 Swedish solutions and innovations were highlighted by all three parties, as well as the possibilities for further collaboration between Thailand and Sweden on these crucial themes. On the 17th of June the delegation visited companies and government agencies on the same themes. In the morning, ambassador Herrström and members from the delegation visited The Royal Thai Police’s (RTP) Traffic division. Great interest was shown for the the Swedish traffic safety policy ‘zero vision’ and the solutions presented by the Swedish delegation. Visits were also made to i.e. the Metropolitan Electrical Authority (MEA), the Department of Highways (DoH) and the Electricity Generating Authority of Thailand (EGAT). Nuclear technology has received warm welcome from many countries, which have applied it for development purposes. 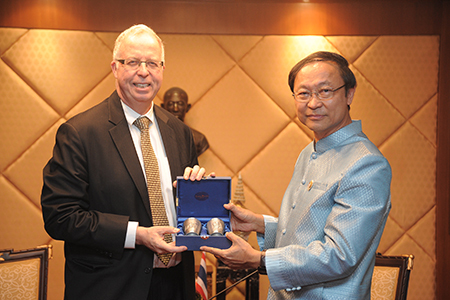 In Thailand, scientific studies and nuclear-technology development have been extensive. To entrepreneurs in both industrial and medical fields, nuclear technology proves a great alternative. It, after all, can increase the value of various products for not just domestic but also overseas markets. Nuclear exceeds all expectations in terms of benefits. It is useful in medical, healthcare, agricultural, industrial, environmental and food fields. Several countries across the world have accorded much importance to nuclear researches paving way for them to successfully develop nuclear technology. Among them are Brazil, Chile, Denmark, South Korea, Vietnam, the Philippines and Thailand. Medicine: Nuclear technology facilitates radiation, diagnostic radiology, nuclear medicine, X-ray, and many other procedures used in diagnosing symptoms and providing medical services. Radiotherapy and nuclear medicine can cure both tumors and cancers. Cobalt 60 is used in cancer treatments, gold-198 in skin-cancer therapy, and tantalum-182 wires in cervical-cancer cure. Radiation, moreover, helps sterilize medical equipment. Agriculture: Irradiation services have been active in the field for more than 25 years already, and with immense successes. Radiation breeding improves plants. Cobalt-60 radiation, for example, can enhance the characteristics of many varieties and increase the value of crops such as the jasmine rice Khao Dawk Mali 105. Thanks to radiation treatment, yellow lotuses from the United States can grow in Thailand making the country the first in Southeast Asia to be able to host this floral plant. Radiation, moreover, is widely used to sterilize insects for pest-control reasons. When it comes to food preservation, irradiation works well for spices, herbs, seafood, fermented meat, mango, longan, rambutan, lychee, pineapple, mangosteen and dragon fruit. Food irradiation is an export standard as countries like the United States, Australia and New Zealand use it for food safety. Industries: Because nuclear technology boosts productivity, facilitates quality control and lowers production cost, its use has become more widespread in Thai industries. Radiation now helps with the production of synthetic thread, increases the heat resistance of insulators, and supports the manufacturing of hydrogel bandage for quicker wound healing. Neutron rays are efficient tools for the exploration of underground oil too. Among the highlights in the industrial sector is gemstone irradiation. When irradiated by high-energy electron accelerators, crystal topaz can turn "Sky Blue" and even "Swiss Blue". As its color changes, its value significantly jumps. Each year, high-energy electron accelerators can treat up to 4,800 kilograms or 24 million carats of gemstones. Education: Studies have been conducted to check radioactive levels, such as uranium level, in natural areas just as isotope technology works great in determining the rate of groundwater flow and surveying groundwater sources. Radiation, moreover, contributes to wastewater treatment, organic-fertilizer production, farmland development, forestry and hydrological activities. To ensure Thailand’s nuclear development roars ahead, Thai researchers have received grants to further their study overseas. They are expected to return to their homeland and put their knowledge to good use. In all, nuclear technology has emerged as an alternative for new-generation entrepreneurs. It also promises to be a key tool for Thailand’s further development if various sectors agree to join forces in driving the country ahead on a sustainable basis through nuclear innovations. To make this thing happen, the government and private sectors along with relevant agencies both in Thailand and beyond must support nuclear technology. Nuclear technology won’t seem irrelevant to Thais’ lives anymore. The Thailand Institute of Nuclear Technology (public organization) has now given Thai youth opportunities to show off their talent at the robot contest 2016 whereby their robot inventions will engage in nuclear technology. In conjunction with the contest, the International Nuclear Science and Technology Conference will also take place at the Centara Grand at Central Plaza Ladprao between 4 and 6 August 2016. This important forum will bring together more than 500 nuclear specialists and researchers from around the world. Outstanding academics and researchers are scheduled to make 133 oral or poster presentations during the event. They are hailed from China, India, Indonesia, Iran, Japan, South Korea, Malaysia, Myanmar, South Africa, Sweden and various other nations. 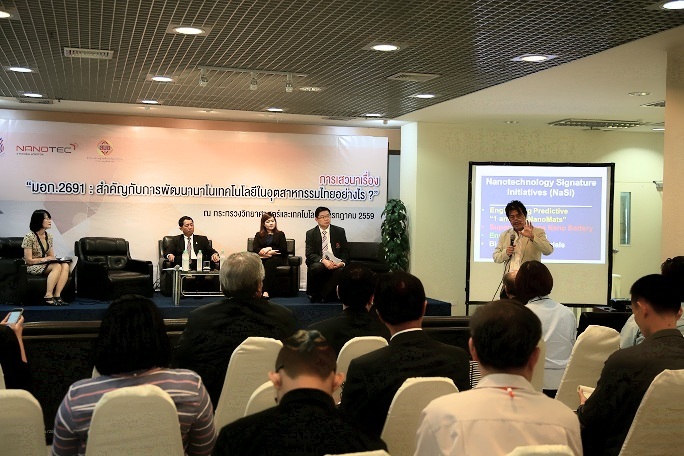 Thailand will also use this forum in showcasing its remarkable nuclear technology. TCELS joined hands with Cosmetic Valley, the French developer of cosmetic for Asians. Push the city of Cologne investment in the special economic zone in Thailand. 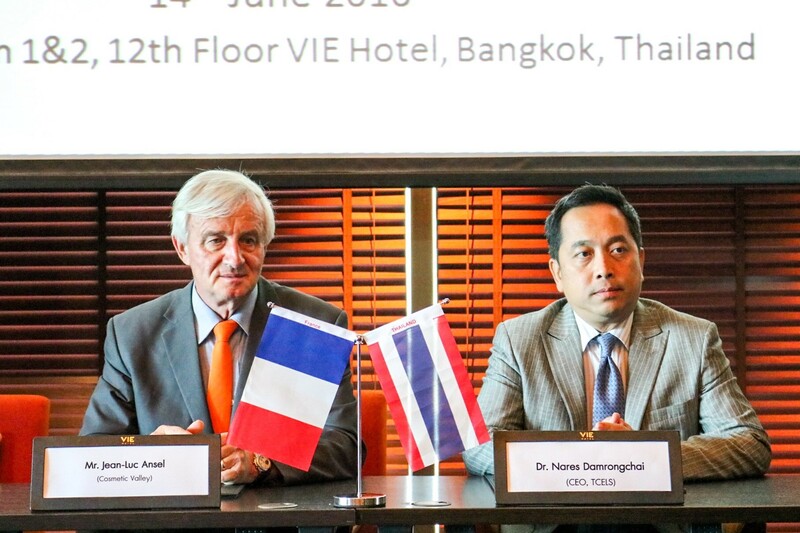 Dr.Nares Damrongchai, Chief Executive Officer (CEO) of Thailand Center of Excellence for life Sciences (TCELS) and Mr.Jean-Luc ANSEL, president and founder Cosmetic Valley from French, has signed the joint memorandum (MOU) in research and development of standard for cosmetic to support the special economic zone and Asean countries. Beside, H.E. Mr. Gilles Garachon, Ambassador of France to Thailand and inter-department joined witness. Ministry of Science and technology prepare to organize ‘Startup Region’ joined hands Ministry of Information and Communication Technology pulled Digital Economy raids across Thailand’s region. In Top Excusive meeting at Minister of Science and Technology. (On June 15, 2016) – In Top Excusive meeting at Minister of Science and Technology. 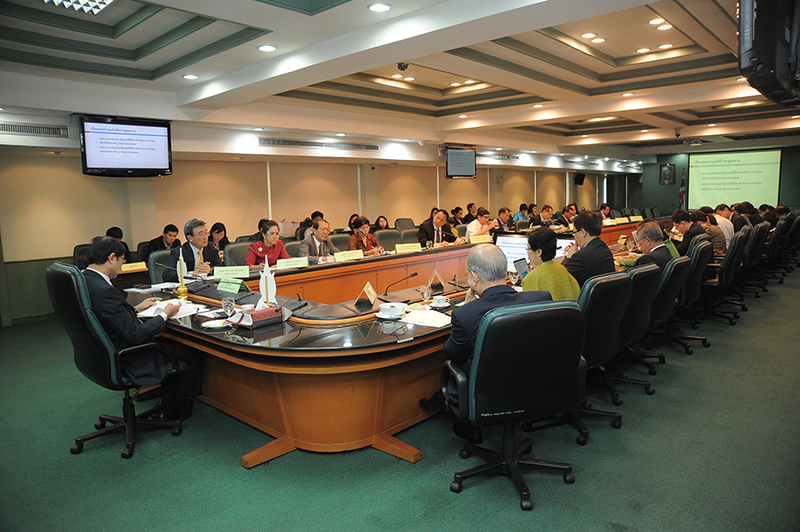 Dr.Pichet Durongkaveroj, Minister of Science and Technology, As­soc. Prof. Dr. Veera­pong Pair­suwan, Deputy Per­man­ent Sec­ret­ary and the excusive team joined the meeting and discussed on Startup region’s Thailand will joined hands the Ministry of Information and Communication Technology organize ‘Startup Region’ in 3 regions; Chingmai province, Khonkaen province and Phuket province.Besides, prepared to summary Results of the second round last year. Portuguese representative courtesy call Dr.Pichet Durongkaveroj, Minister of Science and Technology to discuss cooperation and push the science, technology and innovation. (On June 13, 2016) – At the Office of the Permanent Secretary, ministry of science and technology (MOST). Mr. Francisco de Assis Morais e Cunha Vaz Patto, Ambassador of the Republic of Portugal to Thailand along with his team paid a courtesy call on Dr.Pichet Durongkaveroj, Minister of Science and Technology. In this courtesy call, Mr. Francisco de Assis Morais e Cunha Vaz Patto and Dr.Pichet Durongkaveroj are discuss on Agreement on Scientific and Technological Cooperation between Government of the Kingdom of Thailand and the Government of the Republic of Portugal. 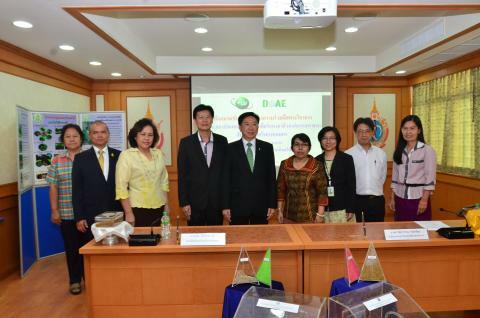 Thailand Institute of Nuclear Technology (Public Organization) (TINT) and Department of Agriculture (DOA) signing of a joint memorandum (MOU) works in research for the Bactrocera dorsalis Hendel to reducing an insects of industrial area. 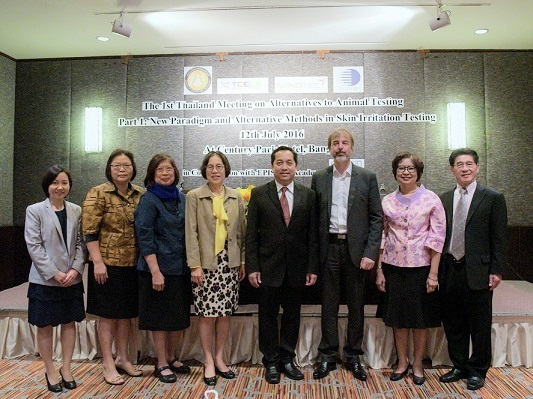 In order to reduce the amount of fruit flies in Thailand has an extensive and more efficient evacuation, Thailand Institute of Nuclear Technology (Public Organization) (TINT) under Ministry of Science and Technology (MOST) which has the Experts in the use of nuclear techniques to sterilize fruit flies. And Department of Agriculture (DOA) under Ministry of Agriculture and Cooperatives (MOAC) which is the important department to pushing the agriculture researches to farmer or agriculturist by signing of a joint memorandum (MOU) with TINT to development of the genetic-sexing strains of white-thoraxed Bactrocera dorsalis Hendel by using radiation-induced sterile insect technique. Then, promote and utilization in Thailand. As a follow up activity to the recent press conference on minimizing the use of animal testing in Thailand, TCELS and NANOTEC with collaboration from EPISKIN Academy organized the 1st Thailand meeting on Alternatives to Animal Testing at Century Park Hotel in Bangkok. In addition to ethical and regulatory discussion, researchers and scientists from EPISKIN Academy and NANOTEC are also presenting their research findings at this meeting. Part I of the meeting will focus on “New Paradigm and Alternative Methods in Skin Irritation Testing”. Part II which will take place on August 24-25 also at Century Park Hotel will focus on “Understanding and Acceptance of Alternative Methods”. 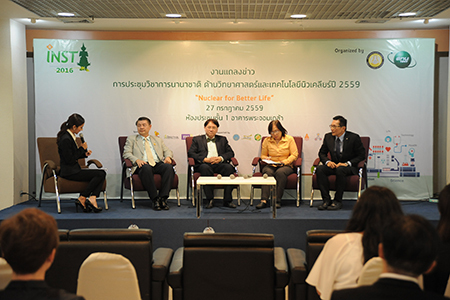 The Ministry of Science and Technology (MOST) with collaboration from NSTDA, NANOTEC, Nanotechnology Association of Thailand, and Thai Industrial Standards Institute (TISI) organized a panel discussion on “Industrial standards manual: Development of nanotechnology industry in Thailand” this morning at the ministry. The aim of the discussion is to provide information to media, research agencies, and private sector groups on the importance of industrial standards manuals to enhancing economic trade and competiveness. Vol 1:Standard Nanotechnology, guidelines specify the requirements of manufacturing nanomaterials. Vol 2: Standard Nanotechnology Characterization, Guidelines for the production of nano-materials. Vol 3: Standard Nanotechnology, Guidelines for the removal and nanomaterials safely. Vol 5: Guidance on nanomaterial risk evaluation. TISI indicated that they hope to approve the 7th manual in a few month and will consider additional manuals in the near future.